"It’s sad when a person feels their life is so empty and meaningless that the highlight of their day is to invade an otherwise peaceful capital every noon hour and raise a raucous in the rotunda. If these attention-starved individuals really wanted to contribute something helpful to society, they would spend their days volunteering in soup kitchens or homeless shelters rather than putting on infantile demonstrations for public gratification. Then again, helping people that really need it wouldn’t attract the TV cameras and news reporters that these individuals so desperately crave." I called Representative Sanfelippo's office, and was told that if I emailed my questions, he would answer me. 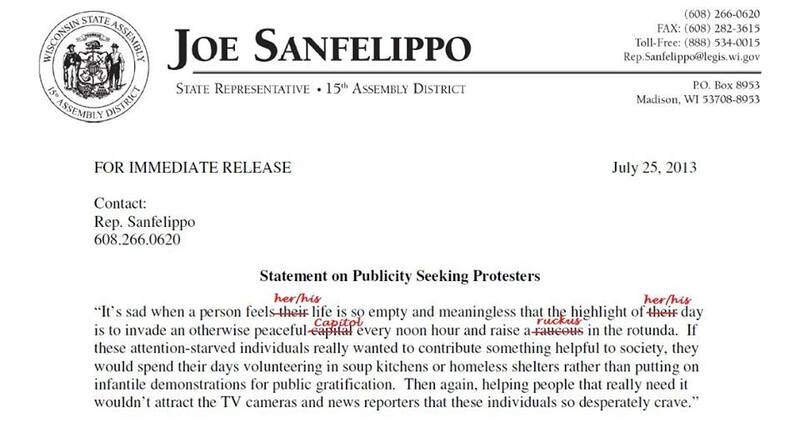 I am guessing that they were busy volunteering at the homeless shelter(or writing poorly worded silly press releases). * When was the last time YOU volunteered at a homeless shelter or soup kitchen? * Have you ever felt such things about lobbyists who are perpetually in your office and meeting with you? * Would you afford the same amount of meeting time with MS. Kemble as you do Convicted felon Scott Jensen? * Do you think that that the $34,000 people have given you could be better used to help the homeless or for food shelters? * Do you think that the $202,972 That convicted felon Scott Jensen earned as a lobbyist OR that the $2,392,000 that the Walton funded, public school attacking, American Federation for Children spent trying to privatize our public education could have been better spent at a homeless shelter or soup kitchen? That buys ALOT of soup(about 2.4 Million cans). I am guessing that $2.4 Million is more than the budget of the Dane County Food Pantry AND Homeless Shelters combined! By the way, Sanfelippo's quote sounds eerily like another quote from someone who did not like when the peasants revolted - , "for daring and desperate is the spirit of those leaders". The King would have been proud! In May 2011, former state Rep. Michelle Litjens tweeted: "I've had enough! One hour of union protesters singing, 'We Will Overcome' etc. in the Capital (sic) Rotunda!!! When with (sic) the insanity end!" Litjens decided not to run for reelection to “spend more time with her family.” Instead she divorced and finds herself spending lots of time “lobbying” Robin Vos. Bets are on that Vos is using up birth control faster than he is drinking water. 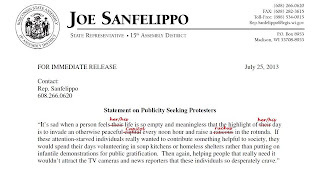 Litjens and Vos symbolize the poor character, along with Sanfelippo, of those who praise Walker and his Republicans for mugging the First Amendment rights of the people. He could go volunteer at the St. Francis Merrill, WI soup kitchen. Yes! If you are poor, you, too, can have soup -- on Tuesdays for dinner. So, let Joe know, St. Francis could use his help. The poor people will just take "personal time" from work (from a part-time Walmart job with no benefits) when they're starved for a bowl of soup. These poor people will just hop in their cars (that they don't own), filled with gas (they can't afford) for a bowl of soup. That is, when the church doesn't cancel in order to instead harass women at Planned Parenthood in Wausau with the priest's blessings. While the St. Francis priest follows (NOT) the example recently established by the Pope -- to care for the poor...which the priest does by living in a huge house, with a nice Buick and SUV, a salary, vacations, healthcare...and, oh yes, free lawn care.